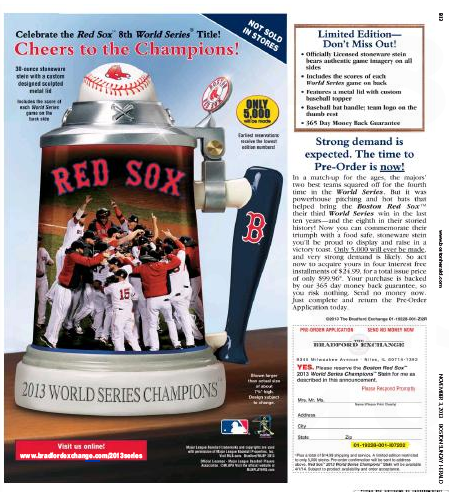 As the hardreading staff noted yesterday, the Boston Globe cleaned up on ads in the paper’s World Series Commemorative Section celebrating the Red Sox championship. 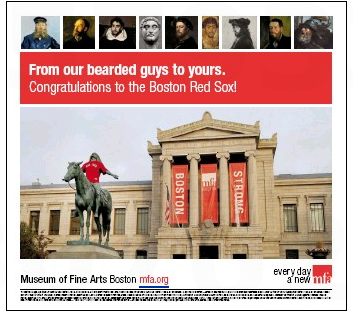 The Boston Herald, meanwhile, got its clock cleaned, with only four ads compared to the Globe’s 34. 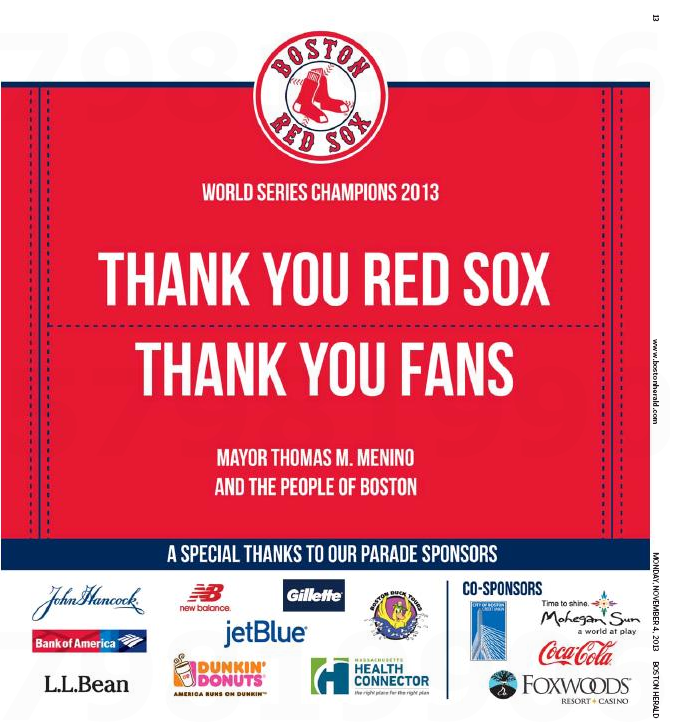 Especially galling to the Heraldniks must have been the full-page ad Mayor Tom Menino and the Victory Parade sponsors ran in the stately local broadsheet. But journalistic justice prevailed today, as this appeared on page (lucky) 13 of the feisty local whatever. Now if the Herald can just chase down those other 29. 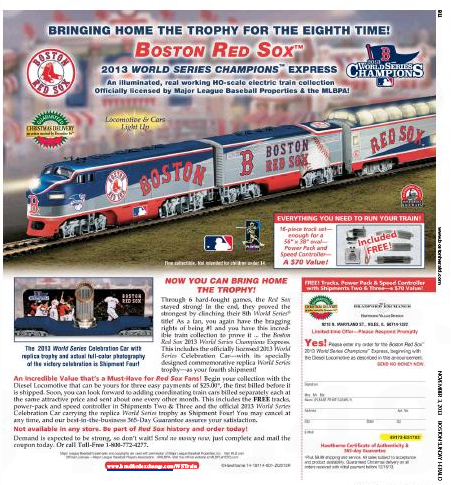 Once the Boston Red Sox – sorry, World Series Champion Red Sox – took Game 6, flooded the clubhouse with bubbly, painted the town Red for the rest of Wednesday night, and rode the duck boats into MLB history, it was all over but the touting. Enter today’s Boston Globe 40-page Special Commemorative Section, which is one giant duck boat for advertising. The ads come in three categories: bearded, beardless, and merchandise-hawking. The hardcounting staff tallies 34 ads of various sizes, over half of them full pages. 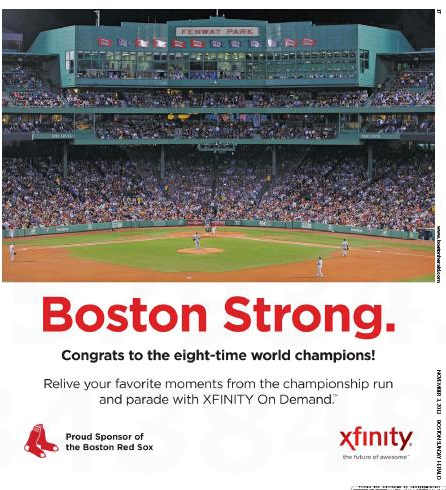 Crosstown at the Boston Herald, the ad count is . . .
Sullivan Tire with a new one. Bradford Exchange with a new one. Bradford Exchange with the same awful one. If the Globe/Herald Daily Bakeoff were a prizefight, they’d stop it. 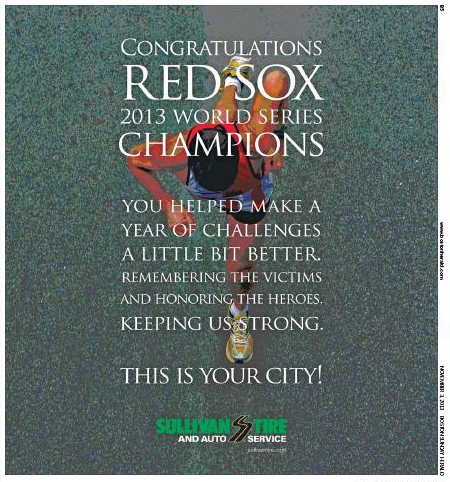 Did John Henry Buy the Boston Times? 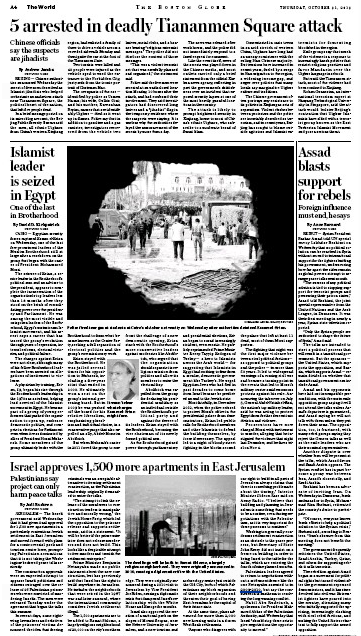 On a day that the Boston Globe has produced fabulous, comprehensive coverage of last night’s Red Sox World Series Championship win, it might be easy to miss (and churlish to note, some would say) that the New York Times provided 50% of the paper’s A section today. (Associated Press 27%, Boston Globe 22%). Page A4 was entirely picked up from the Times. Don’t get us wrong: We realize the majority of the Globe’s A section has to consist of wire-service reports; that’s the reality of the Texas-chainsaw newspaper business. Beyond that, we recognize the Globe is a big local newspaper with a big local footprint. Not every day, though, features a World Series win. Almost every day, on the other hand, features an A section that’s Times Lite. Given the financial relationship that Red Sox owner John Henry just ended between the Globe and the Times, the latter’s lingering presence seems, we dunno, weak. And 50% is a lot of lingering. Media Nation’s Dan Kennedy made a strong case last week about Why John Henry should dump Times content. Today’s edition only buttresses that.